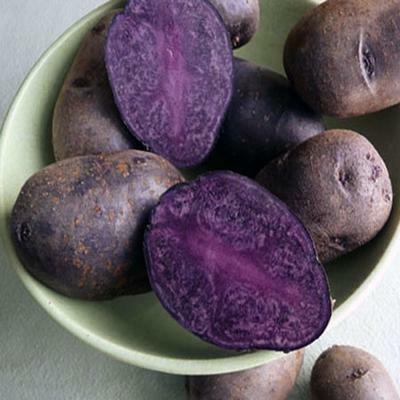 In the UK, the market entered a new variety of potato, rich purple color. Purple also remain all derivatives of this vegetable - mashed potato, potato chips, etc., It called Purple Majesty, the taste is the same as its more familiar to us normal potatoes, but full of anthocyanins - they give blackberries, blueberries,and aubergines their distinctive colors. New variety of potatoe is grown in Scotland. This year has been collected over 400 tons of the crop, which is not a lot, but in the next year, manufacturers plan to make a great increase. Blue potatoes are divided into several types. For example, grades Franzosische Truffel-kartoffel and Linzer Blaue the cooking process does not lose its color is dark blue in color and very much fall apart. While the other two Linzer Roze and Kipfler long enough prepared and boiled soft, but the cooking process lose their unusual color. They are usually used as raw Jerusalem artichoke in salads.